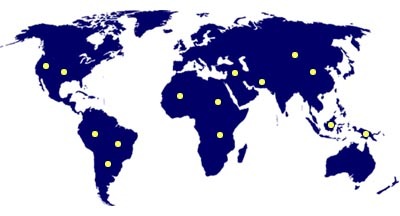 Since 1995, we have been exporting our products to all parts of the world both to developed countries like USA, UK, Germany, Switzerland, Spain etc, and to developing countries like China, Sri -Lanka, Malaysia, Indonesia, Bangladesh, Pakistan, Singapore, South Africa, East Africa etc.Marketing & Distribution. We have built up marketing function which is sensitive to end users needs and requirements. As a part of this system each batch of our final products are comprehensively tested in the laboratory equipped with the computerized dying and colour matching equipments. Depending upon the specifications desired by our end users, the final products are eventually packed in boxes, drums and environmental friendly paper bags. An utmost concern and commitment towards quality, packing and delivery schedule is a decisive factor for worldwide acceptance of our products.